Whether you’re talking million-rand projects, monthly stipends or receipts for transport and airtime, participatory public art practice is loaded with tricky questions about the politics of payment. The top-down relationship between funder, artist and community creates all kinds of power imbalances, which are exacerbated when rubbing up against the issues of access to capital. ‘Honesty’ and ‘transparency’ are words often repeated, but on the ground it seems these things can mean very different things for each party involved. The fact is that money changes any negotiation or collaboration, problematising issues of value, visibility, accountability, skills transfer, funding and budgets. The Con spent the last few months talking “politics of payment” with many public art practioners, collectives, project managers and administrators. 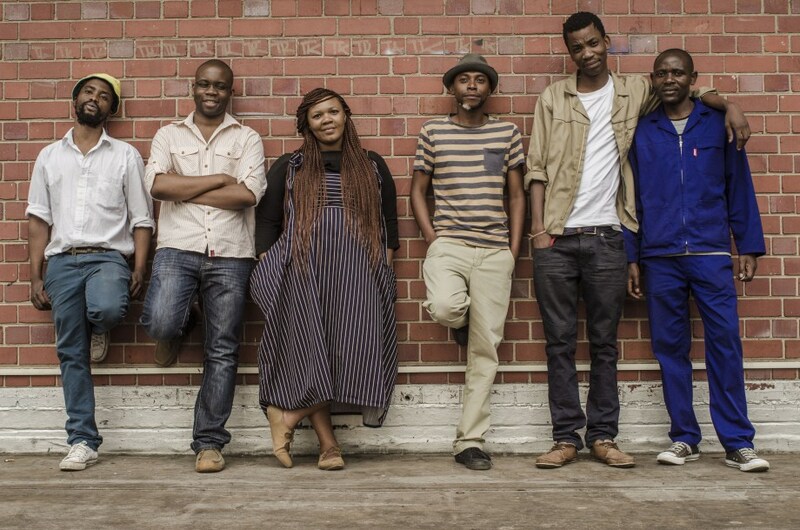 Fihla is a founding member of a collective called Dlala Indima, which participated in a project run by the Visual Arts Network of South Africa (Vansa) in 2010, called 2010 Reasons to Live in a Small Town. Their project, which involved cleaning up and painting an abandoned building in their community and turning it into an art centre where kids could hang out, caused some tension in the community because issues around payment were not communicated properly. According to Fihla, the biggest lesson he learnt was the need for transparency with regard to funding. “It’s like ‘look, this is how much we have to spend on this so we must all decide’. You learn from these things and at the end of the day everybody got paid,” he says. The Con sat down for a chat with Vansa director Molemo Moiloa on the sidelines of an artists’ workshop for the network’s new participatory public art project titled 2014 Ways of Being Here. According to Moiloa, this lobbying is happening at the national and provincial levels, especially in Western Cape, “where the mess has been the worst”, she says. In the past, according to Moiloa, public artworks were conceptualised as “monolithic” things, made to last “a hundred years”. She describes South Africa as a country prone to the spectacular. “When we do things, we do things big,” she says. With its focus on the everyday, she sees 2014 Ways of Being Here as an antidote to that way of thinking. The project was conceived to explore what is meant when we use the word ‘democracy’, and asks whether we are paying attention to smaller organisations such as collectives, unions, community groups and stokvels when defining democracy. Moiloa is concerned about the cost of projects such as 2014 Ways of Being Here, especially when they don’t impact many artists. “Part of the structure of the project is that the artists don’t produce the content for the funding, so Vansa creates a buffer between funder and artist,” she says. This, arguably, is necessary because the value Vansa places on the project is not necessarily a piece of art or a performance, it is in the interrogation of artists’ practices within these contexts and the documentation of this process. So at the end of the day, value is not derived from a statue built on a street corner but in the more fundamental political questions that are inherent in participatory pubic art practice. Issues of money, payment, value, visibility, accountability and funding are up for debate. According to Moiloa, the administrative burden placed on Vansa and the artists to account for spending on projects is a major challenge, especially when you have to navigate the informal economy and receipts are not possible. She says it has also raised questions around the ethics of outsider artists going into poor communities with money in their pockets. Rangoato Hlasane and Malose Malahlela founded the Keleketla! Library in 2008 at Drill Hall in Hillbrow, Joburg, which has since moved to King Kong in nearby Troyeville. The library is currently taking part in the 2014 Ways of Being Here project. In an article in the book Creating Spaces: Non-Formal ART/S Education in Africa, published in 2014 by the Goethe Institute, Hlasane and Malahlela recount issues they’ve faced in setting up the multidisciplinary arts centre. The article, titled Bigger Than the Tick Box: Defining Interdisciplinary Art/s Education to Funders, details how funding and accounting cycles impact on the sustainability of projects and spaces. These issues often lead to a race to the numbers to justify the capital invested and, as a result, corners are cut, which negatively affects the real outcomes of projects. Hlasane and Malahlela write: “We wished to create a space for expression that feeds from the inner-city context – the food, the films, the processed noise, the smell, the voices, the fashion, the struggle and the hustle of the streets. Culture is not the mere production of art, craft or music. Culture is an element of life, entangled in a web of political and economic realities. “We must not work on the assumption that people need to be stars, or artists, or learn skills; rather, we need to work from reflection, from dialogue that is not a chase towards the funder’s report or this school’s examination. “Culture, like nature, has a tendency to strike back at us if we rush towards utopia. Culture, like education, is lifelong; it asks for grace and needs a pace that is rooted in context. Instead of innovative, ground-breaking work created out of meaningful exchanges, funder’s reports comprise graphs, tables, numbers and photographs capturing smiling groups of children. Artist Dean Hutton complained to The Con about art practice always having to “shake a tin at capitalism”. Hutton argues that funders behave like corporates, “asking for too much and giving too little”. Vaughn Sadie is an artist currently reading for a PhD in management science (public management). 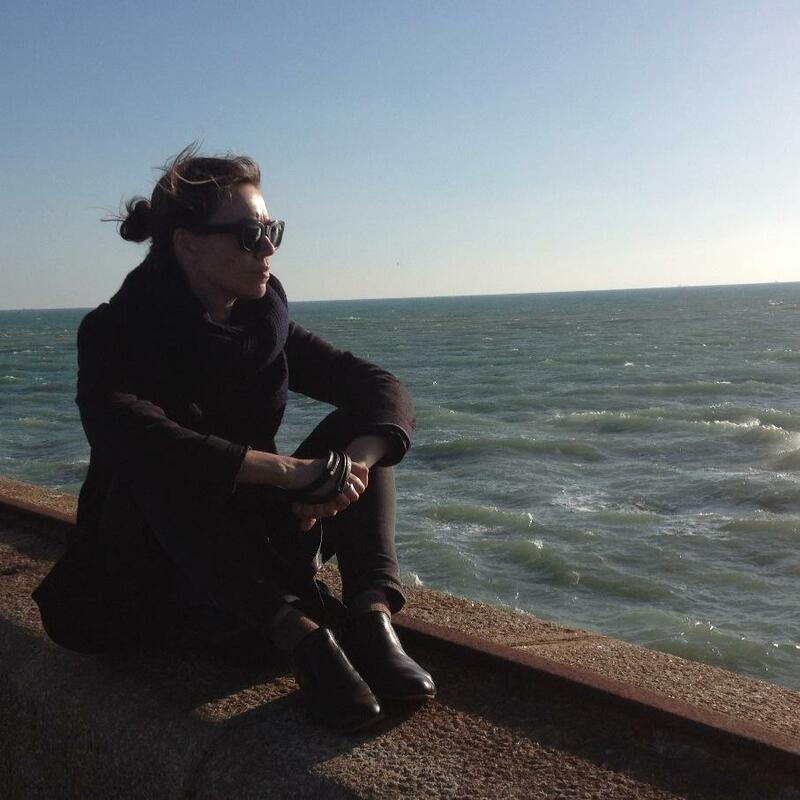 He is also a project manager for one of Vansa’s participatory public art projects called Revolution Room. In June 2013, Sadie began developing relationships with the community in Cosmo City, northwest of Joburg, where the South African leg of the project is based. His negotiations and mapping of Cosmo City are aimed at creating an entry point for five groups of artists to run their own participatory art projects under the Revolution Room banner. Sadie says: “The idea was that if we did enough initial research, there would be enough of a relationship for the artist to move in and out of. I think it was really up to everybody to renegotiate those spaces and relationships. A lot of the projects haven’t continued within the relationships and networks that were established. According to Sadie, Revolution Room asks interesting questions about artists’ practice. He says: “It is exploring what it means to be a group of practitioners working in a similar way. I don’t think we have a rich history of [participatory public art] in the country in the sense of it happening in this way. But with Revolution Room, the artists are participating in workshops, sharing their experiences and challenges, and documenting them. “I think it’s interesting how people believe they are operating in silos then all of a sudden, they come into a room and realise there is commonality. “There are definitely questions emerging around the practice that I find really, really interesting. The role of money, how you resource a project, the way that you work – all of these things are being questioned,” says Sadie. These questions involve what money “really means” and the “hierarchies of power” when money changes hands. “All of a sudden, someone becomes an employee. You want them to be accountable,” says Sadie. But payment can sometimes act as a limitation to the individual’s ability to imagine their own place in the project, as money is often attached to clearly defined roles and responsibilities. Sadie asks rhetorically if the money is not paying for buy-in from the community. According to him, money often leads to a situation where everybody wants to hold everybody accountable in terms of what they are taking and not giving. At the end of the day, the manner in which artists negotiate is key. “You can go into a community or you can do a participatory project with five people, and you could pay everybody a load of money if you wanted to or you could pay them a R100 – it’s how that is negotiated,” says Sadie. 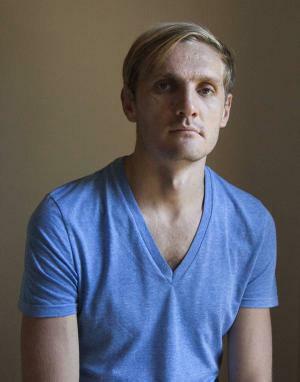 Joburg-based independent curator Amy Watson is one of the artists taking part in Revolution Room. 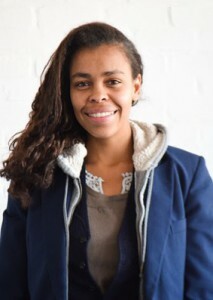 In collaboration with Wits human geography lecturer Alex Wafer, she’s pursuing an audio-based project in Cosmo City. The project initially proposed to explore soundscapes and storytelling for a radio platform, however, its scope has since shifted to working with choirs and exploring repertoire. Speaking to The Con during a Revolution Room workshop, Watson says negotiations around money in projects like theirs are “awkward conversations all round” owing to the unequal power dynamics. They cover food and all travel expenses for their collaborators. She shares an anecdote about how community members’ everyday lives directly impacted on and shifted their participation in the project. Another artist, who did not want to be named, shared an anecdote about a participatory art project where there were underlying causes to shifts in participation by community members. 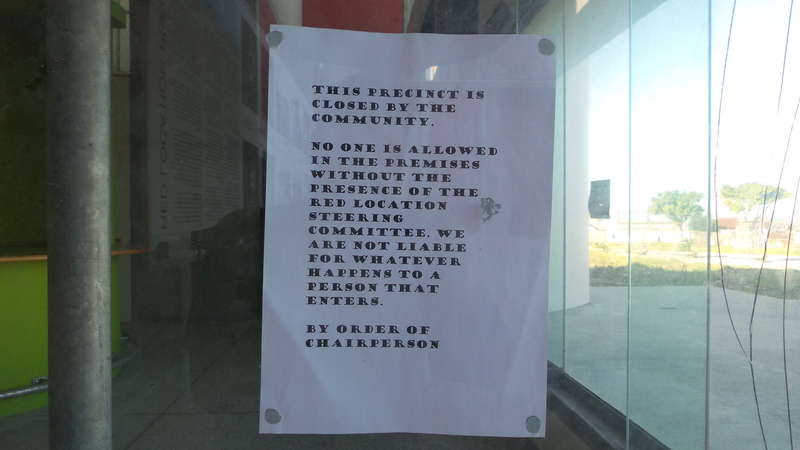 The artist had secured a group of community members to act as consultants on a participatory public art project. During negotiations, it was agreed that everybody would be paid the same amount, but one of the community members expressed she was unhappy to be paid the same as everyone else months later. Her reasoning was that she didn’t see herself as an employee but as a manager. “So even within this collectively negotiated structure, power dynamics were at play,” says the artist. The artist later discovered the woman’s husband had died and she had to look after their children on her own. Lindo Zwane is part of the Wang’ Thola collective, a group of eight young artists based in Joburg, who are also participating in Revolution Room. Their project is interested in boundaries physical and imaginary within a community, particularly how these boundaries are constructed. Wang’ Thola is going about its work by means of collaborative interventions in the community. Brian Mtembu from the dance and performance collective Ntsoanna is also participating in Revolution Room and is at the same workshop. Ntsoanna’s project explores the perception among residents of Cosmo City that there is no xenophobia present there. Ntsoanna’s project has evolved into the shooting of a music video in the community, where the staging and performance of the shoot is the end result, not the video itself. According to Mtembu, they had to negotiate with a group of pantsula dancers who refused to take part unless they were paid. But paying the dancers would have opened up a can of worms, where everybody who participated in the performance or planning it could have demanded payment. Port Elizabeth-based Artists Banele Ndajayi and Bamanye Ngxale are taking part in the 2014 Ways of Being Here project. The two artists are working with eight teenagers from Walmer township to build a miniature informal settlement from found objects. This model will then be installed at Red Location, another township north of Port Elizabeth. For the second part of the project, Ngxale and Ndajayi are planning to work with the teenagers to document, through audio and video, the stories and perspectives of the residents of both Walmer and Red Location. The recordings will then be projected out of the model. But the two artists have hit a snag in their project, and it’s over money. Ngxale says the old jazzman pointed out that many in the community would expect payment because documentary projects had already been done in the community before and people were paid “substantial amounts” for their stories. “That became a problem for us because as soon as we spoke of the project, he asked how much he’d get for the interviews because he can’t just give us something and not get anything back. It makes sense. There has to be something that comes his way that he rationally finds beneficial to him. “We have to find some way for everyone to be in agreement with regards to what they get for what we are doing. They realise we don’t have much to offer,” says Ngxale. Meanwhile, back in Phakamisa, Fihla and his Dlala Indima collective are also participating in 2014 Ways of Being Here. As part of the project, Fihla has been negotiating to paint the caravans or carts from which entrepreneurs sell their wares. He calls it #Spazasprays. “At first, I tell them about the organisation, what we’ve done in Phakamisa, and then I tell them that all I really want to do is paint something casual – some graffiti, nice and colourful,” says Fihla. “It’s going to most probably be a name – my name or a continuation of the Dlala Indima message in there. Of course, spaza-shop owners such as sisters Busisiwe and Noluthando Wana are also looking to benefit. 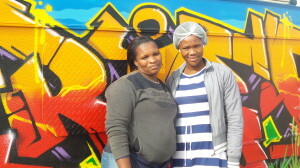 From the early hours of the morning for six days a week, the pair sells food from a caravan Fihla has graffitied. Their menu on the door, painted by Fihla, advertises “pap en vleis” (pap and meat), “isibindi” (liver), “umngqusho” (samp and beans), “umphokoqo” (African salad) and ulusu (tripe). They reckon they serve more than 100 meals a day and have more customers since Fihla painted their caravan. Main Pic: Busisiwe and Noluthando Wana’s caravan spaza, painted by Buntu Fhila.